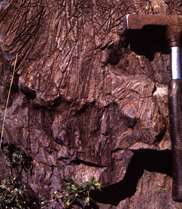 Outcrop of komatiite lava from the type locality in the Komati Valley, Barberton Mountainland, South Africa, showing the distinctive 'spinifex texture' formed by dendritic plates of olivine. The plates get smaller and more randomly oriented towards the top of the flow, at the top of the image. (PhysOrg.com) -- A research program aimed at using platinum as an exploration guide for nickel has for the first time been able to put a time scale on the planet’s large-scale convection processes. The research is reported in a Nature paper titled “Progressive mixing of meteoritic veneer into the early Earth’s deep mantle”. We are seeing the signal of that stirring, which took about 1.5 billion years to occur. This is the first time a time scale has been put on the stirring, which has important implications for the people who study the dynamics of mantle processes and the mechanisms that cause plate tectonics, earthquakes and volcanoes. Combined with some other work by the researchers on sister elements to platinum, iridium and osmium, we also now have a new framework for understanding the variations in isotopic ratios of osmium with time. Osmium isotopes are widely used as tracers of mantle processes, but there has been a mismatch between signals from osmium and from other important isotopic tracer systems which has eluded explanation until now. Co-authors Dr Marco Fiorentini and Dr Wolfgang Maier from the University of Western Australia are delighted that this is a completely academic outcome which came out of an industry-funded project. “It is a nice example of an unexpected fundamental discovery arising from a practical applied science study and demonstrates the very positive collaborations that exist between CSIRO and the University of Western Australia,” Dr Fiorentini said. This is an interesting story. It is true that all platinum on Earth today once came in as extraterrestrial material. Earth formed by accreting meteorites and perhaps an occasional comet and other extraterrestrial debris. Earth is still accreting extraterrestrial material today. The incoming material originally consisted almost entirely of iron meteorites. Hence the iron cores of the terrestrial planets. Stone meteorites formed further from the Sun. Those that later lost angular momentum fell toward the gravitational center of the solar system - the Sun. In crossing the orbits of the inner planets, the iron cores accreted stone meteorites. Hence the stone mantles of the terrestrial planets. The idea of heterogeneous accretion was proposed by Karl K. Turekian and S. P. Clark, Jr. in 1969 ["Inhomogeneous accumulation of the earth from the primitive solar nebula," Earth & Planetary Science Letters 6 (1969) 346-348]. Plate tectonics time scale is 100-200million yrs. Much faster than the mixing they describe.